I began writing this on the grey, wet August Bank Holiday Monday. The schools were still out for the summer holidays and the rain was pouring down. My thoughts turned to the floods of earlier this year and those of 1953 when I was seven years old. 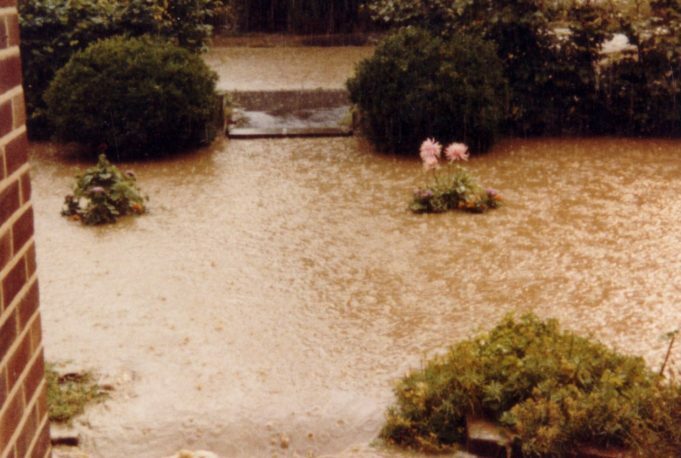 There were however, other occasions when flooding occurred, on 9th July 1981 for instance. We were living in Woolmergreen, Lee Chapel North, just a few yards to the east of Markhams Chase School which lies fairly low in a valley between St Nicholas Church Hill and the high banked Laindon Link. My parents, Jessica and George Burton were living in Kennel Lane in Great Burstead where they had moved in 1975 after the compulsory purchase of their plotland bungalow ‘Spion Kop’ in Alexandra Road, Laindon. It had been a fine morning but in the afternoon the skies towards London darkened. A storm ensued and the heavy rain became torrential. Due to the deluge, our back garden began to resemble a lake. Our two children sat by the patio doors watching the water level rising ominously higher. I remembered as a child in the fifties, coming out from Markhams Chase School at home time and having to wade through the huge puddle that always formed in the road there after heavy rain. 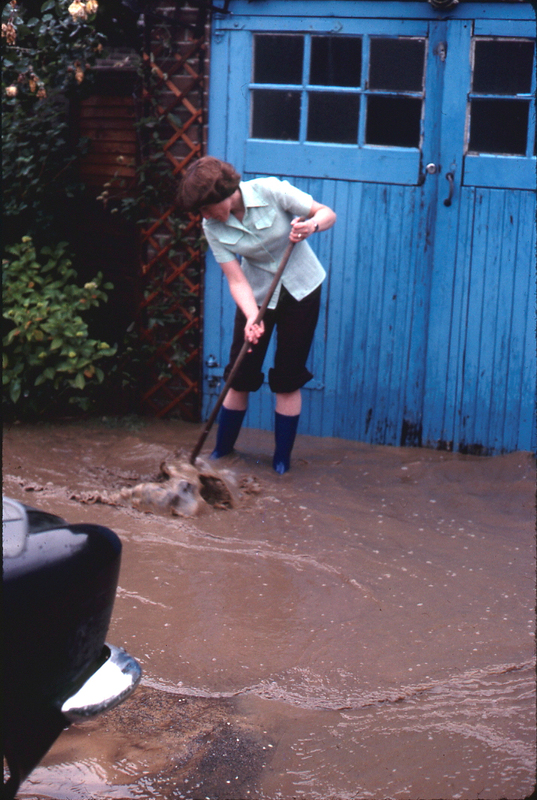 Colin arrived home from work just after 6 pm and packed some sandbags against the step while explaining that on his journey home, the heavy rain had caused Broadmayne to become gridlocked and the noise of the rain pounding on the car had been deafening. Our next-door-neighbour’s brick-built walled patio had filled with water and his lawn was becoming waterlogged. Colin and neighbour began bailing out the patio with buckets. While this was taking place, I had a frantic phone call from my mother in Great Burstead. “We need help, can you come?” Dressed in raincoats and wellies, we drove to Kennel Lane. The storm and heavy rain had caused a flash flood to flow eastward, down the sloping fields of the farms to the west, across Kennel Lane and into their front garden which lay below road level. There was no stopping it as it flowed quickly through the bungalow, swamping the carpets as it went and pouring out through the kitchen door into the back garden. Neighbours armed with brooms were desperately trying to guide the water away from their front doors. We did the same in Mum and Dad’s garden but we were fighting a losing battle. My brother and his wife arrived and together we attempted to avert the water but the flow was simply too strong. The fire brigade eventually arrived with sandbags but they were too late to make a difference as the damage had already been done. The road was still flooded the next morning when people were leaving for work and taking children to school. The drains hadn’t been able to cope with the deluge. Eventually after a few days the water sank away and the full extent of the damage could be seen. The carpets were ruined by the deposited silt and the smell was horrible. They had to be rolled up and taken outside, a claims assessor was called for and an insurance claim submitted. Strangely, none of the neighbours could remember a flash flood ever having occurred there before and apparently there hasn’t been another since. This was a minor incident in comparison with some of those in recent years around the country. The prediction of further similar occurrences in the future due to our changing climate doesn’t bear thinking about. Living in a valley may be pleasant and protective against strong winds, but there is much to be said for living in a house on a hill when the rain comes. 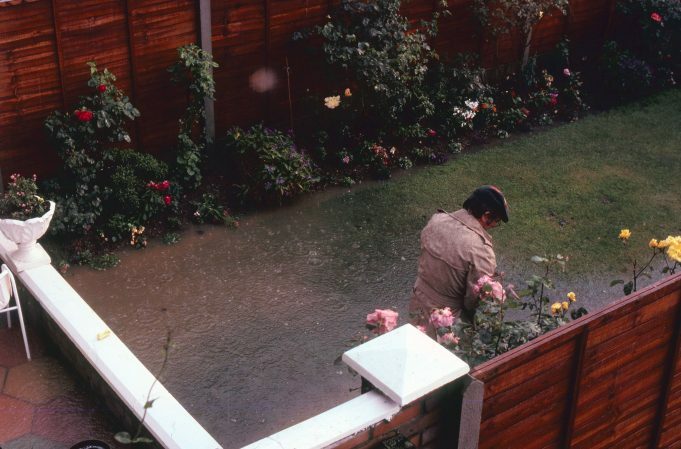 Our neighbour's flooded back garden in Woolmergreen 9th July 1981. 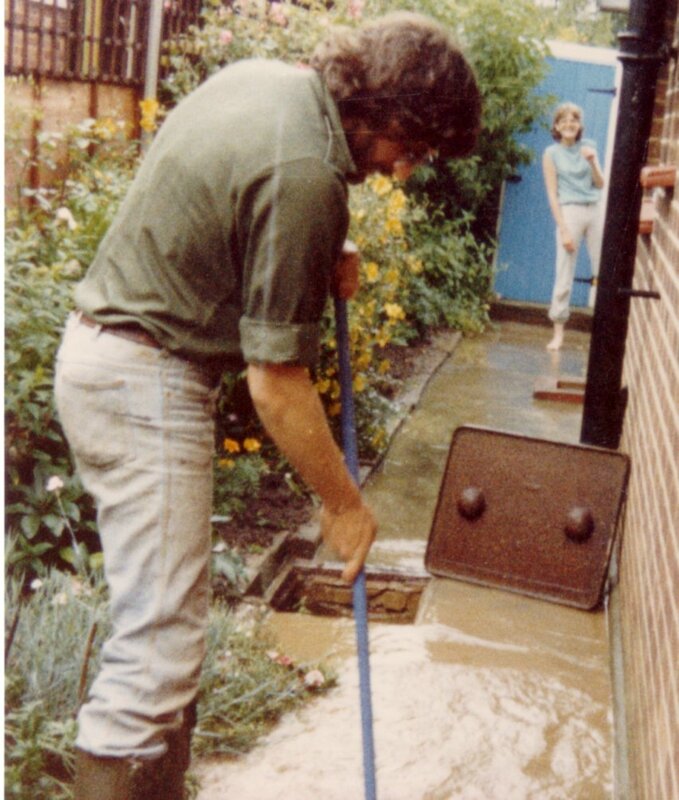 Trying to guide the water down the drain and away from the bungalow in Kennel Lane. Ankle deep infront of the garage. Scene from the door step. Front garden had disappeared below the water. Kennel Lane in the background.